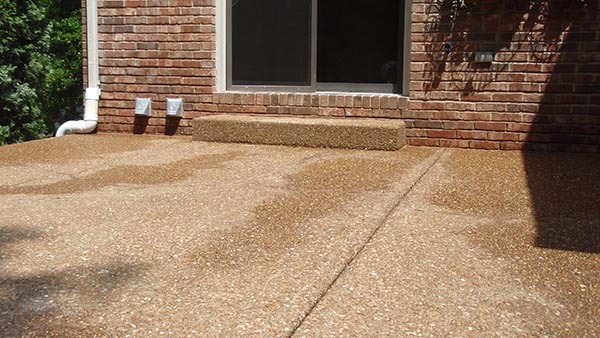 Learn how our concrete leveling and repair can help. Say hello to a smooth, even driveway once again. 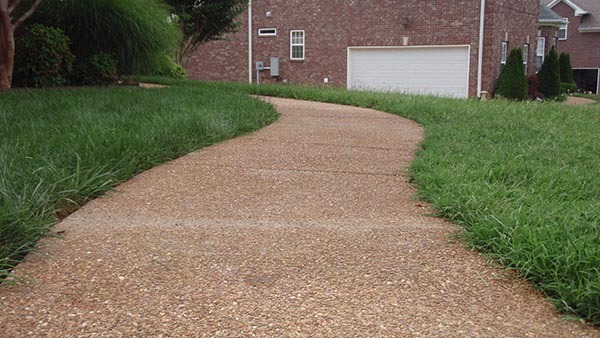 Sloping or cracked driveways aren’t just an eyesore — they’re also safety hazards. 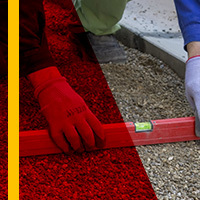 With A-1 Concrete Leveling and Foundation Repair, our concrete contractors can get your driveway in working condition once more, while also raising your property value. 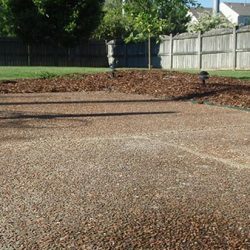 Read more about driveway repair here, and then contact us today for a free estimate on your project! Here in Nashville, we take pride in Vanderbilt University, the Grand Ole Opry, and the Country Music Hall of Fame. We take pride in our families, our culture, and our hospitality. Why wouldn’t we also take pride in our homes and driveways? They’re an extension of who we are and often show how we feel about ourselves and the world. 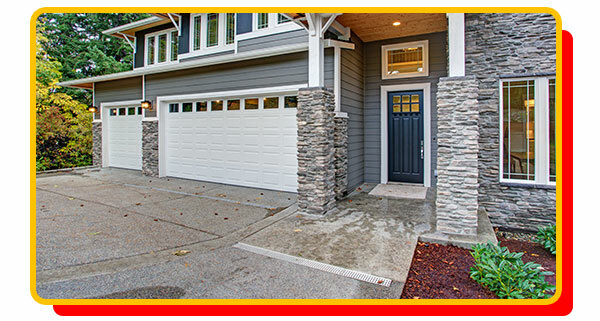 Your driveway is one of the largest focal points of your home. 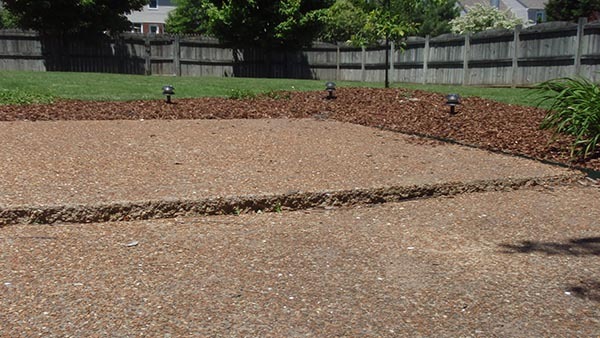 If your driveway is sunken, uneven, or severely cracked, we can help you. After all, it’s not just an eyesore; a driveway in disrepair reduces the value of your property and is dangerous. 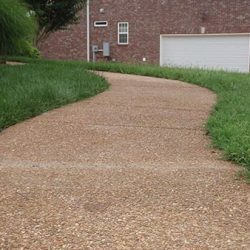 Why Do Concrete Driveways Become Uneven? Why do we have to deal with this in the first place? There are a whole host of reasons as to why driveways sink, develop cracks, or need general repair. Soil erosion, burrowing animals, tree root growth, improper foundations, heavy loads, and sharp objects are all frequent causes. Additionally, when water freezes, it expands. Whatever cracks the water was in will expand with the ice. Then the water will thaw and the process starts all over again, with detrimental effects on your once-smooth driveway. Get a free consultation with us, and we’ll try to determine what caused the damage and suggest the best driveway repair option for you. For driveway leveling and driveway crack repair, there’s no reason to go through the expensive and time-consuming process of tearing out and replacing your concrete. 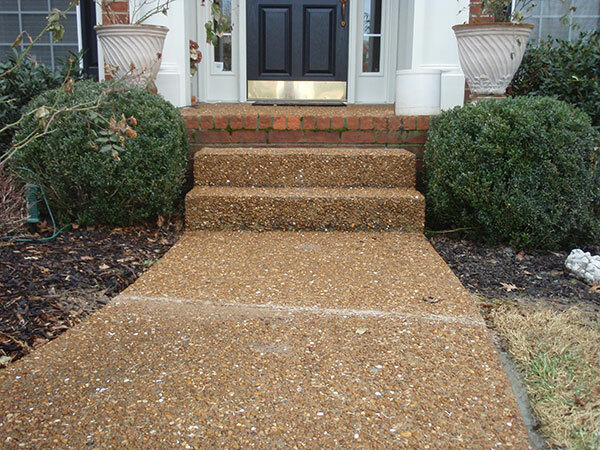 With A-1 Concrete Leveling and Foundation Repair in Nashville, repairing your concrete driveway is simply in a day’s work for us. 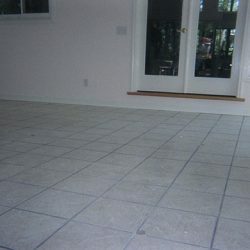 We’ll level your concrete instead of tearing it out and replacing it. This process ultimately ends up saving you time, money, and unnecessary stress. How’s The Concrete Leveling Process Work? 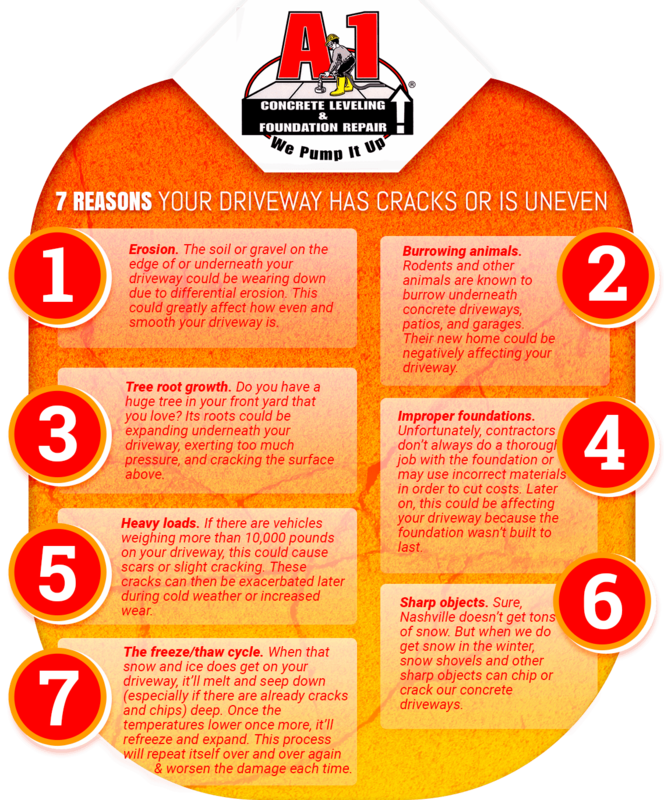 Have you seen a crack steadily progressing farther and farther up your driveway? So you think your driveway is uneven and slanting one specific direction? You may be right. Both of these are situations in which we can level your concrete floor and eliminate your headache about the condition of your driveway. Concrete leveling is actually a logical process and technique, but that doesn’t mean it’s a home-improvement project you can do by yourself on the weekend. Professionals have the knowledge, materials, and equipment necessary to get the job done accurately, quickly, and safely. A-1 Concrete Leveling and Foundation Repair in Nashville has professionals you can trust and equipment that’s proven to work. 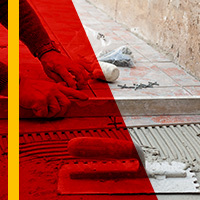 The video above showed you our patented concrete leveling and restoration process. This was done on a sidewalk, but it’s the same theory and process for driveway leveling. 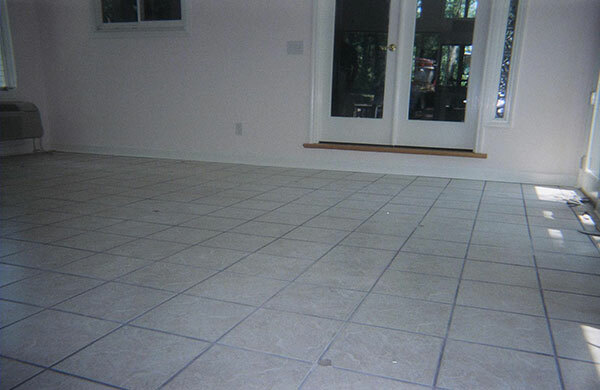 Initially, we choose strategic locations where we can fill cracks or even out the driveway. In these locations, we drill small holes with diameters about 1-inch long. Then we pump our environmentally friendly limestone aggregate into the holes to fill the empty space beneath your concrete slab. This will gently and safely raise the slab until we get your driveway at the desired, correct height. As you can see, the process is simple enough. However, it takes attention to detail and years of experience for us to repair your concrete driveway just right. One of the best parts about this process is how little time it takes to complete. 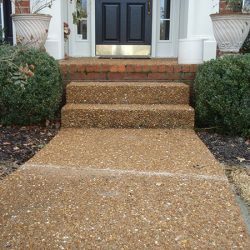 You care about your home’s curb appeal, but the idea of having your concrete driveway completely replaced can seem daunting. Our team of experts can often get the entire project completed within a single day. Even better, the concrete can bear weight immediately after we finish. Because there’s no waiting, no permits to acquire, and no old concrete to dispose of, you’ll be saving a significant amount of time. We know that being a homeowner is expensive. 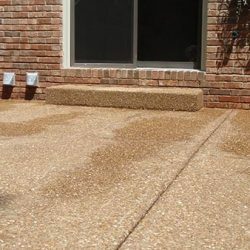 The initial process was costly, but then you also have to maintain upkeep over the years and deal with unexpected problems like foundation crack repairs, sidewalk leveling, and driveway repairs. It’s a hassle at best, and it’s completely overwhelming at worst. Many homeowners rationalize putting off the work, but as a responsible homeowner, that’s the last thing you should do. A-1 Concrete Leveling and Foundation Repair in Nashville recognizes how stressful the process and the costs can be. We hope to help you through it and save you headaches, but we also want you to recognize how important it is to get the work done quickly. 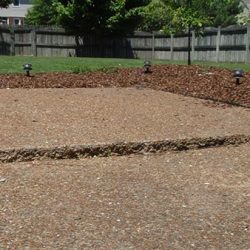 As soon as you see signs of disrepair indicating a need for driveway leveling or driveway crack repair, you should contact us and make changes. Although it can sometimes take longer, we can often complete the work in a single day. This alleviates the need to stress about how much time it’ll take. If you wait too long to contact anyone for repair services, then you could have a much more time-intensive and expensive project on your hands. Your home or your business is mostly likely the biggest purchase you’ll ever make. By fixing driveway problems now instead of later, you’re investing in your future and saving yourself from costs and headaches down the road. If you’re unsure of how big of a problem it really is, you may be inclined to wait it out and see what happens. Don’t do this! If it is a sign of a larger problem, we can let you know and fix it in advance. Simply get a free consultation from us and we can help you know. A cracked driveway or unlevel driveway isn’t just annoying or unappealing. It can be dangerous. We offer a free consultation. When you’re unsure whether you need concrete leveling, concrete raising, or foundation repair — or even just need to know if you need anything at all — there’s no cost for you to find out. We cost less. We’re generally not telling you that you should replace your entire driveway. More often than not, we can find a solution to your problem simply with our patented technology that leaves your current driveway in place. 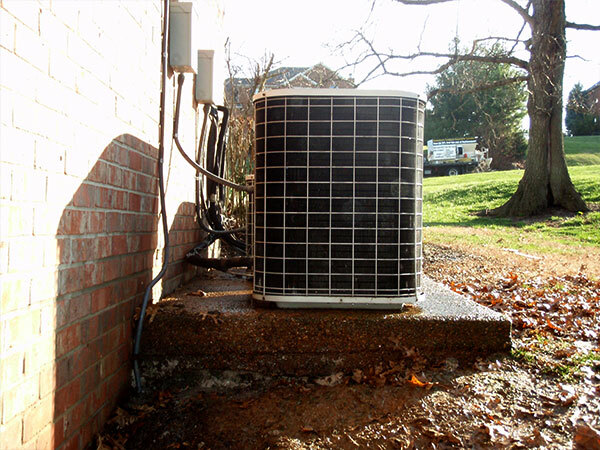 This ends up saving you up to 80 percent of the price of replacement, and it is just as effective. We save you money later on. It seems to be a principle of life: if you don’t pay to fix the problem now, it will worsen and cost you more down the road. Unfortunately, driveways are not the exception to this rule. When it comes to your home or business, don’t take the risk of increased stress, harm, and costs! Just get it taken care of now — you’ll be grateful you did. We provide you with excellent customer service and products at an affordable rate, but we’re also committed to doing what’s right for the environment. At A-1 Concrete Leveling and Foundation Repair, all of our products for driveway leveling and driveway crack repair are natural. We want to keep Nashville, and the earth, beautiful for many years to come. Other companies use chemical-based polyurethane foam when performing driveway repairs or floor leveling. 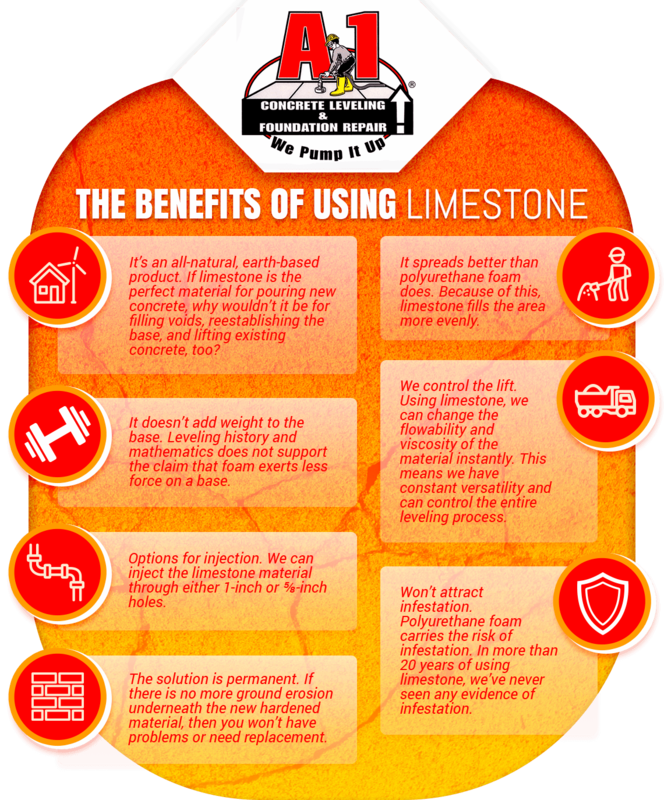 We, however, choose to use only the tried-and-true method of limestone grout. When new concrete is poured, limestone is used as the base anyway. It makes sense to fill voids and reestablish the base with the same material. Why not replace earth with more solid earth? Because of this commitment that we feel to the earth, we donate 1 percent of our revenue in Nashville toward environmental initiatives. When you work with us, a percentage of your money will be giving back to the environment. There’s also no need to worry about this material not working as well as another material would. 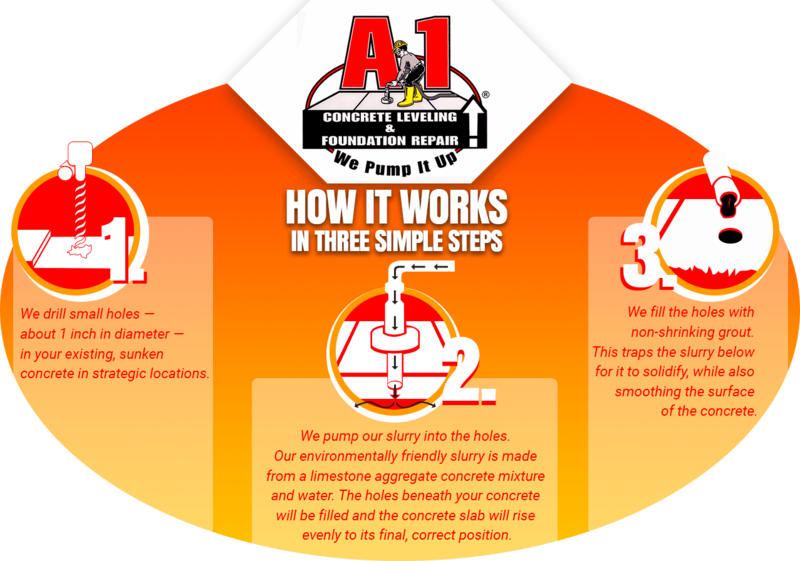 A-1 Concrete Leveling and Foundation Repair has been in this industry for more than 20 years, and we’ve solved just about every sinking concrete problem that we’ve come across with this material that’s safe for the environment. If there are other home or business repairs you need done around your property, we may be able to help. Downspout extensions will eliminate the problem of water draining right by your foundation and damaging its walls. Floor supports will fix your unstable floor. When you have a bowed wall, we stabilize and strengthen it instead of just doing one or the other. 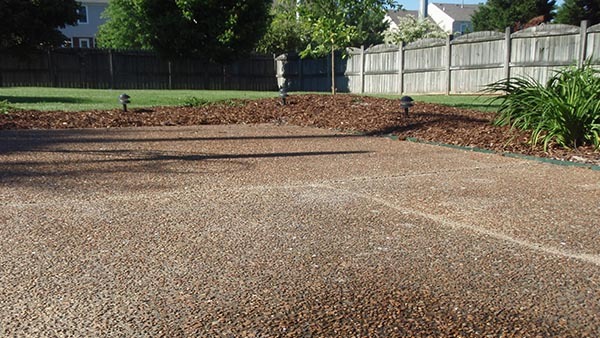 We can repair or level your sunken, uneven, or severely cracked driveway. Porches or patios can develop large cracks over time and take away from your enjoyment or be dangerous. Steps are a serious concern if they’re in disrepair. 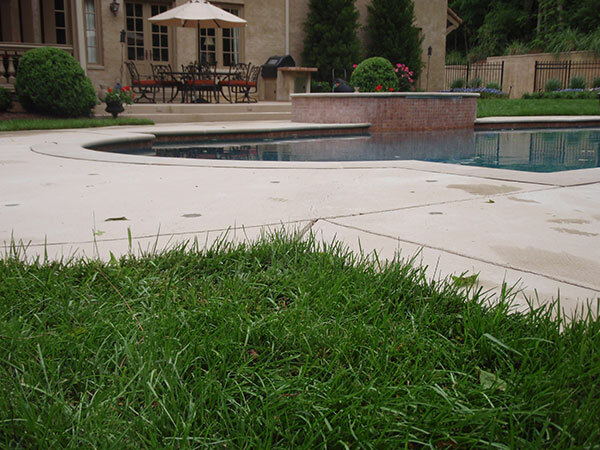 The surface of pool decks is already slippery — don’t let it become more dangerous by not repairing an uneven surface. 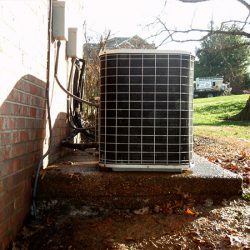 If HVAC or utility pads are uneven, your electrical or plumbing connections could become strained.